Red Bulls 2 DC United 0 - Streakbusters! When I wrote my match preview on Friday I laid out some of the daunting history that the Red Bulls would be facing when they traveled to DC to play United in the first leg of this season's Atlantic Cup. In addition to a 10-game winless streak against DC, the Red Bulls hadn't taken a full three points from an Eastern Conference foe on the road since their trip to BMO Field in TFC's expansion season - an incredible 20 game streak of suckitude. With all that in mind, in addition to voodoo curse DC seemed to hold over us, I hedged my bets by predicting a 1-1 draw. DC United, having started the season 0-4, would be a wounded animal and we all know how dangerous they can be. The Red Bulls, meanwhile, had continued to win despite not clicking on all cylinders. If our luck were to run out, surely it was bound to happen at RFK, right? Never in my wildest dreams did I think that we would walk away from the nation's capital with a 2-0 shutout victory. Amazingly, despite having played DC United dozens of times since 1996, the MetroStars/Red Bulls had never managed to win while keeping a clean sheet in DC. The way things are going this season, I'm starting to wonder if the bad mojo that has been hanging over this franchise is finally starting to lift. When they've needed a big goal, a slice of luck or a big save, the Red Bulls have been able to get it. It's the polar opposite of last season, when a black cloud seemed to follow the team around. Hats off to Hans Backe and Erik Solér, who have instilled new confidence in what is, for the most part, a similar squad to the one that was so incredibly inept last season. In a first 45 minutes that saw DC enjoying the better chances, Condoul produced a(nother) couple of stellar saves to keep the teams level, denying Clyde Simms twice. The second half was a different story, as the fitness work that Backe has been emphasizing started to show against a DC team that wilted in the heat. Dane Richards, who had one of his best games of the young season, burned past Rodney Wallace on the right wing, cut inside, and set the ball on a plate for Salou Ibrahim to apply the finish. RBNY didn't waste much time in adding to their lead. Joel Lindpere floated a lovely free kick into the box, which found the head of Juan Pablo Angel. Goalkeeper Troy Perkins remained rooted to the spot, as Angel angled the header into the corner of the net. DCU was guilty of poor defending and non-existent marking, but Angel is not going to miss those. The rest of the game saw the Red Bulls defend resolutely. Jaime Moreno and the newly-resigned Luciano Emilio came on to try to salvage a goal or two for United, but they never really threatened Condoul and the traveling fans in the upper deck - your Viper's Nest crew among them - were jubilant at full time. 2-0 to the Red Bulls and a big closetful of skeletons emphatically cleared out and buried for good! Viper should be by later today or tomorrow with a full video report of our team's trip down to the Lair of the Great Satan. I'd like to give props to Miguel, Brian (YSC), Tom Faust, Mark Fishkin and all the other fantastic Red Bulls supporters who traveled down to DC and made this a really special away trip. I can't remember ever laughing so much in one day. There is a great set of photos of the the RBNY supporters inside the stadium here. Click here for a slide show. I'd also like to thank ESC for setting up the pre-game brats and sauerkraut in the parking lot - delicious and badly needed after we lost our way a bit getting to the stadium and ended up driving through one of the capital's "finer neighborhoods" to get to the absolute dump that is RFK Stadium. 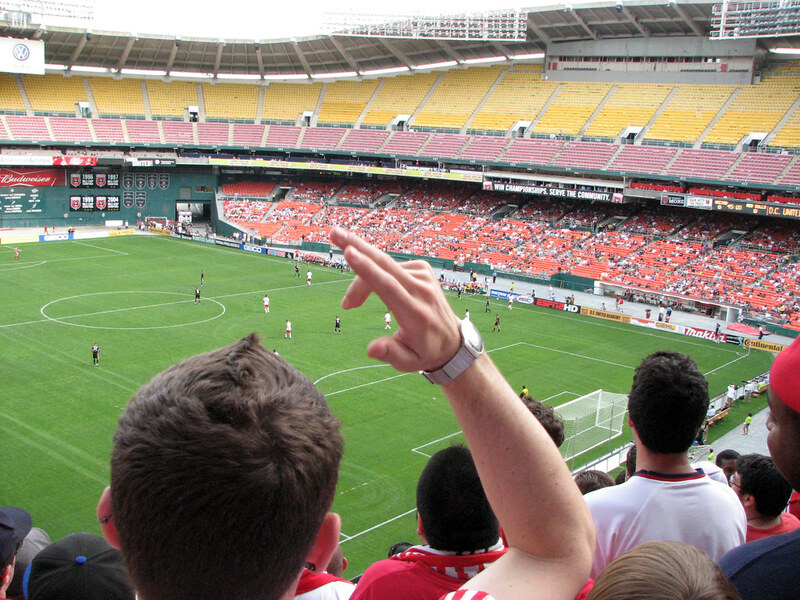 Speaking of RFK, I never want to hear anyone complain about our ownership again. We should be getting down on our knees every day and thanking Uncle Dietrich and his apostles in Austria for giving us a stadium and a team to be proud of. The crumbling RFK is a huge black eye for the entire league. Getting DCU out of there should be Don Garber's priority #1. If it means moving them up the road to Baltimore then so be it. Please, before the place collapses into the ground under the weight of the couple thousand fans who can be bothered to turn out for a rivalry game these days!